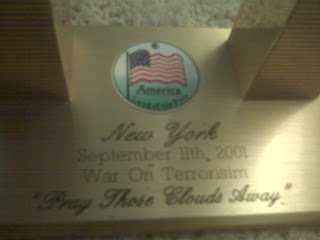 A solid brass tribute to the World Trade Center, and quite heavy. 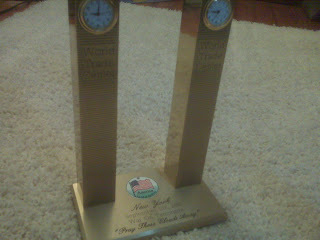 The Towers each have a clock in them, stopped at the time when the planes hit each tower. There are numerous examples of tributes like this. My collection features a handful, which are posted on this blog. Each example has its own features, but this one is pretty unique. I also think this qualifies as a sculpture piece.